Throughout the year I host I many professional development webinars on Practical Ed Tech. Recently, I bundled some of the most popular of those webinars into one package that I call the Ed Tech Starter Kit. The webinars selected for inclusion in this package cover topics and skills that can be applied to almost any classroom. How to Build a Classroom Blog. All webinars are accompanied by printable handouts for your reference. 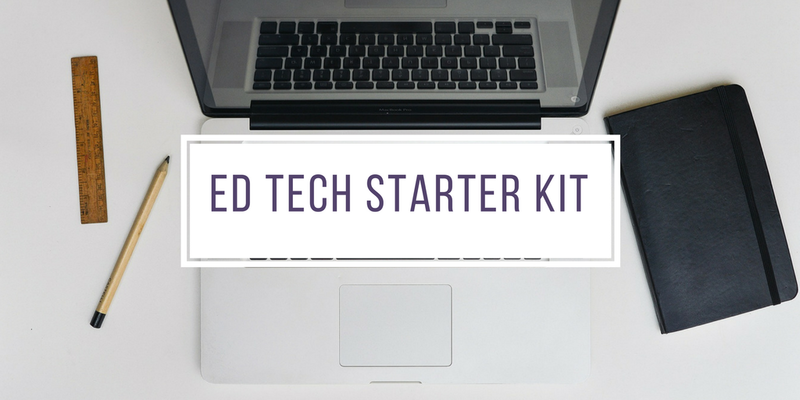 The Ed Tech Starter Kit costs just $50 and you have unlimited access to view the materials whenever you like as often as you like. That’s a 50% savings compared to purchasing the webinars individually. In this package you get them all for half of that cost. What’s Covered In the Ed Tech Starter Kit? In this webinar you will learn why informational searches are the hardest types of Internet searches for students to conduct. You will learn how to help students break-down complex search topics into manageable pieces then put the whole picture together. You’ll learn how to help your students save students tons of time by thinking before searching. And you’ll learn how to develop instructional search challenge activities to use with students of any age. In this webinar you will learn how to use free tech tools to create and conduct fun, engaging, and informative formative assessments. Whether you teach elementary school, middle school, or high school, you will come away from this webinar with fun formative assessment activities that you can do tomorrow. This webinar addresses the needs of teachers who don’t have computers or tablets for every student. And teachers who do have laptops, Chromebooks, or tablets for every student will learn some new ways to have students use those too. Google Forms and Sheets can complete all kinds of tasks for you, if you know how to use them. Once you’ve learned the basics of Google Forms and Google Sheets you will be amazed at how these powerful tools can streamline processes for you. Those streamlined processes can free up lots of time for you to spend on the fun aspects of teaching. Over the last ten years I have helped hundreds of teachers create blogs and websites. Whether you’ve never created a blog before or you have started a blog only to see it fall to the wayside, this webinar is for you. This webinar covers how to pick the best blogging service for you, how to get students involved in blogging while also protecting their privacy, and how to actually create and manage a blog. About the cost: Whenever I publish a post about my professional development webinars I get asked something along the lines of “if they’re not free, why do you advertise them here?” The reason is that while the tools that I share and the methods that I share are free to implement, my time for teaching isn’t free. Additionally, there are a lot of costs associated with hosting webinars. Finally, the sales of these webinars helps to keep Free Technology for Teachers running.